As a team with fifteen years rug retail experience, we know that finding the perfect rug to compliment your room and your lifestyle is a very personal thing. We also know its important because the perfect rug, as well as adding functionality, can really add that all important finishing touch to a room. Perhaps you know that you would really love a specific shade of blue or simply have your heart set on something that little bit different which could give a talking point such as an evocative striped design? Whatever you want, why settle for something thats almost, but not quite, the one? As we also had some rather clever technological people on our team we decided to fuse our passion for rugs with our passion for the best of modern technology which we hoped would make for a more satisfying shopping experience. By making our rugs to order, via our online store, we hope we can help you find your perfect rug by offering you a superior level of choice in terms of shape, colour, design and size to that found in a physical store. We hope this means no more endless searching for the right shape or size or that perfect colour match. 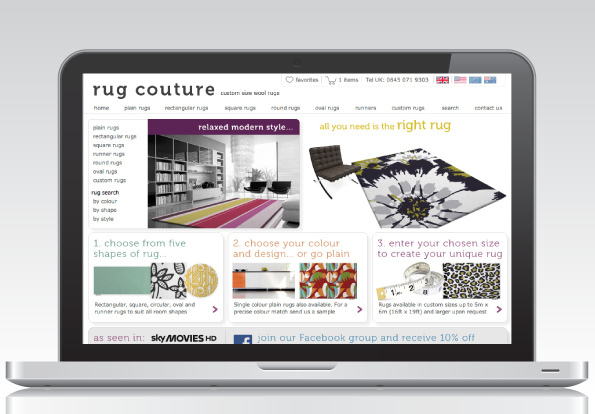 Now you need look no further than rug couture to find the perfect rug for your scheme and lifestyle. Go plain or choose from hundreds of designs in almost every conceivable colour way or contact us here for a fully bespoke order. In offering a choice of size we also ensure that we can help customers with particularly large rooms but that you are always only paying for what you actually need. Please don't worry if specifying your own size is a little daunting as you will find a list of popular rug sizes on every product page to assist you.